Bonus Information: 100% match bonus up to £100 on initial sign up. Fairway Casino are one of a few live casinos that offer free play on live blackjack and the rest of their live games. 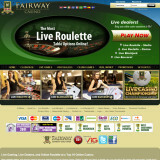 No deposit or signup is needed to play, you get a fun balance of £500 and play on the same table as real money players. The only difference is that you cannot choose your stake level, it comes fixed at the top tier, which is £5-£500 and you cannot use the chat facility. The dealing room is located in Costa Rica in a modern purpose studio built by Visionary iGaming, who provide the underlying software that Fairway live blackjack uses. The primary language on the tables is English, but you will hear the dealers repeat everything in Spanish. I must admit that when I first visited the casino I didn’t like it. There is a lot of background music and general noise and I guess I found it a bit over whelming if i’m honest. I chose to use the free play to get a feel for the place and also to test out the unique Blackjack Early Payout game. It was only after a while that I settled in and actually began to enjoy the experience. The room certainly has a “Latin” feel about it, you even see the dealers in the background dancing along to the music. Hand clapping and table tapping to a beat can also be heard whenever someone tips the dealer. The blackjack table is packed full of features, probably the most you will find at an online live casino. 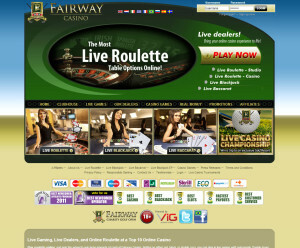 Fairway offer three blackjack games. Blackjack Early Payout, which is a proprietary live blackjack game from Visionary iGaming, that allows an unlimited number of people to play up to three hands. Three side bets are offered, Perfect Pairs, Bet Behind and 21-3, or Rummy as it’s known at the Fairway live blackjack casino. Then there is Vegas Blackjack, which is a standard 7 seat game, using 6 decks and Turbo Blackjack, which is a computer dealt game very similar as the 7 seat game, but you can play up to 3 seats. There are two unique features of the blackjack games that you won’t find anywhere else. Early Payout – where you’re offered the opportunity to cash in your hand before it has been completed. The hand value is calculated after each card is drawn. This doesn’t apply to the side bets. Auto basic strategy is applied – basically the software has the basic blackjack strategy pre-programmed in to it, so will advise on what playing decision you should make. If the basic strategy says stand then it will NOT allow you to take another card, but if its says HIT you can choose to stand. The software interface is quite simple and because of that there is no on screen configuration possible. 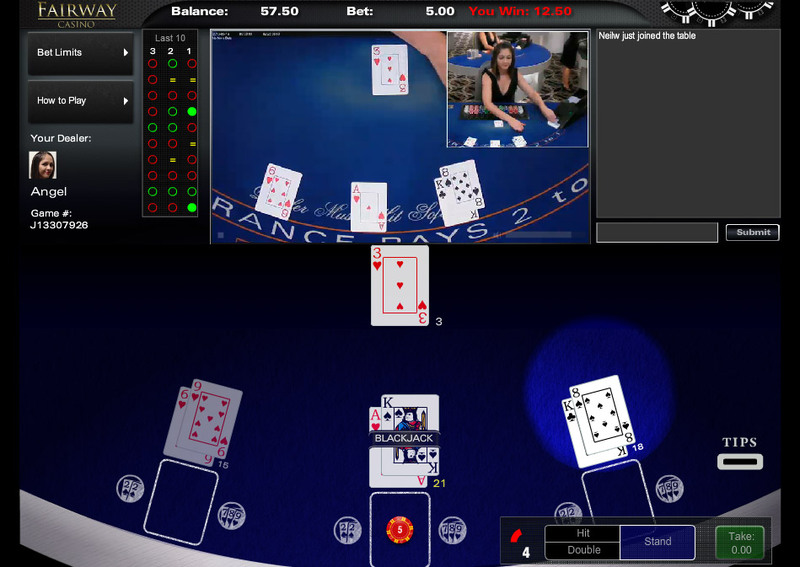 The video feed is in mixed mode, with close ups of the dealers hands when the cards are being dealt. There is an internal chat facility that enables chat between you and the dealer. The outcome of the last 10 hands (win/lose/push or BJ) is displayed for each seat position. I have to admit to being underwhelmed with the streaming, which I found to be laggy and delayed. I don’t like seeing the cards being displayed by the computer before the video feed has caught up, it somewhat ruins the anticipation. Still it just might be my connection, so try it out on free play and see what you think. The dealing shoe is manually shuffled after about 3 1/2 of the 6 decks have be dealt and this is performed by the dealer right in front of you. Your hand history is not available to you online, you have to make a request to customer services to be sent it by email which is a bit of a fag. A variety of banking options are available, Clickandbuy, Delta, ECO Card, Maestro, MasterCard, Neteller, Paysafecard, Skrill, Solo, Switch, Visa Credit, Visa Electron. You will need to complete a Credit / Debit Card Authorisation Agreement if you’re planning on using these as deposit methods. GBP and Euro are the supported currencies. In addition to insurance, three side bets are offered. Perfect Pair – This pays 11:1 on any pair, betting is limited to £1 – £50. 21-3 (Rummy) – Pays 9:1 for a flush, straight or 3 of a kind. Betting is limited to £1 – £50. Bet behind – where you can place bets on other players hands whilst seated at the table or not. A 100% first deposit match bonus up to £100 is offered, which can be claimed by sending an email to the [email protected] You will have to wager 40x the deposit and bonus before being able to withdraw. Support is only available via Email, although when you are playing at the tables you can request the pit boss / support in chat. I’ve seen the pit boss come to the table if there has been a problem to explain what is happening, which is a nice touch. The software is good, the features on the game are good, the atmosphere is good, deposits and withdrawals are straightforward once you have completed the verification process and having free play is excellent. But I have to be honest, I was a bit wary of playing here. Primarily because Fairway are registered in Costa Rica and are therefore not “Licensed” or independently audited. That means that players don’t have any external mechanism for resolving issues if they are unhappy with the casino. I’ve played here a few times though and haven’t experienced any problems and nothing has appeared in the players forums regarding any issues. So my advice is to use the free play, and just be aware of where you are playing.